The Australian Open has seen some great matches and some interesting developments. Following Murray winning two slams with Lendl in his team, Djokovic has taken on Becker and Federer has hired Edberg. Thus far Djokovic fell earlier than expected and Federer, while getting to the same point as last year fell in straight sets to Nadal. At 32 Federer taking on Edberg is indicative that he is still looking to improve and in one interview was quoted as saying that he still expected another big thing around the corner. Is it blind ambition, not recognizing that advancing years are limiting his ability to deliver wins against the very best, or can he really win another slam? I have my doubts that he can maintain the levels of mental and physical energy required to win seven matches over two weeks that is required to win a slam, however, the hiring of Edberg has helped in a number of ways. Edberg won all four junior grand slam events in 1983 and Olympic tennis gold when it was an exhibition event for under 21s in 1984, illustrating his potential as future slam winner. While he won his first two slams in Australia in December 85 and January 87, it was at a time the Australian was seen of lesser importance than the other three (which led to the change from end of year to start of year). Edberg was seen as mentally suspect by some, Becker for one voiced it prior to Edberg beating him at Wimbledon in 1988 (ironically against Becker). One of the things that changed with Edberg in the late 80s was his body language (physiology influencing psychology perhaps). Watching Edberg immediately after the conclusion of a point it was often impossible to tell whether he had won or lost it. It is a classic way of managing your mental energy and staying present. Top players use a number of techniques, having routines between points to ensure that they tune out of the last point and focus on the next. In recent years the current golden generation of Federer, Nadal, Djokovic and Murray, were all good at this, other than Murray, until he took on Lendl. Murray could, at times, be seen to get distracted when things were not going, something that has improved since he’s worked with Lendl. It was something that seemed to be impacting Federer last year, his worst year since he came to prominence over a decade ago. I believe this was something that led to Federer not being effective in staying present. 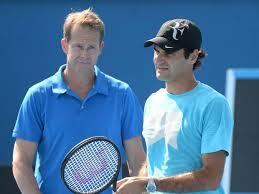 So what is the benefit of Edberg to Federer? 1 While Federer may have been beaten by Nadal in straight sets in the semis, it was a Nadal playing out of his skin. Federer did not play badly. Indeed Federer played some of his best tennis for some time (he maintained ever but I’m not sure about that), in getting to the semis, beating Tsonga and Murray on the way. 2. Edberg’s experience of changing his demeanour to enable him to focus more effectively and stay present would have been a valuable help to Federer, given his problems last year to enable him to get back on track mentally. 3. Reminding Federer that his natural attacking instincts have repeatedly reaped rewards, from somebody who has won in every major arena other than Roland Garros provides a level of support that may well have provided additional psychological help – Edberg got to the final at Roland Garros playing serve and volley, even if he didn’t win. Having the right support is critical and it will be interesting to see how the rest of the tennis year pans out.